And I tested my new shelter, which also worked very well for having lunch under on family walks. There are a few items of kit it these photos, that I haven't posted about. 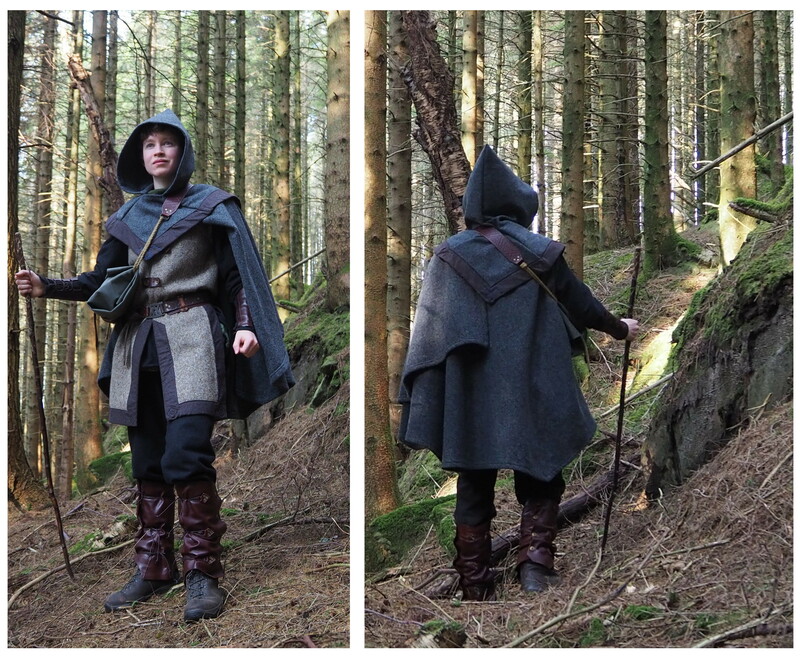 The most noticeable is my new cloak and hood, made specially for this holiday. They're made from waxed canvas and are fully waterproof, I stayed dry in both rain and snow. In the 5th image it's raining quite heavily – sadly my camera wasn't good enough to pick that up and When I was out in a blizzard it was to windy to balance my camera in a tree (I did try : ), the 7th image is the day after the blizzard. Ooooooo! 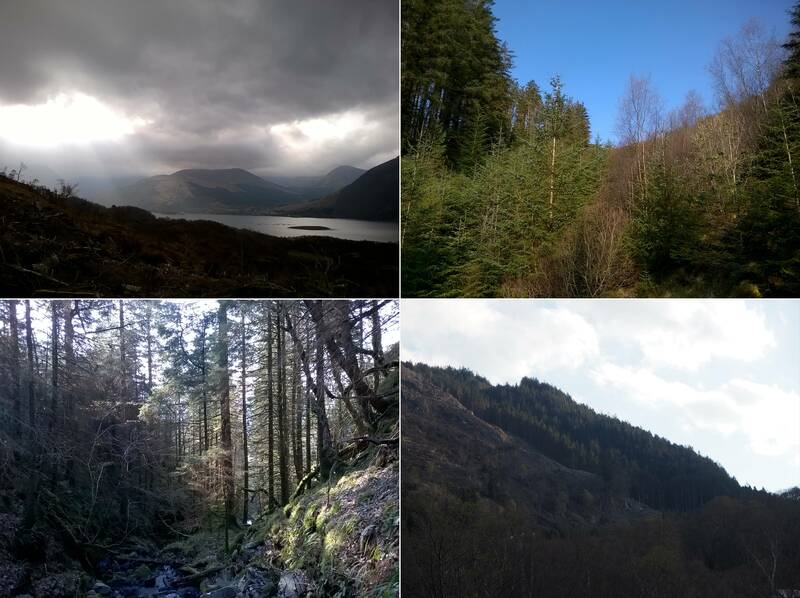 It's always good to see folks out and about in their kit, and it looks like you had some lovely country to roam! Well done on getting out in it, even if only for little bits at a time! Iodo wrote: And I tested my new shelter, which also worked very well for having lunch under on family walks. I'd love to get some details on your shelter components - what are you using for your tarp and groundcloth? Iodo wrote: The most noticeable is my new cloak and hood, made specially for this holiday. They're made from waxed canvas and are fully waterproof, I stayed dry in both rain and snow. Where I usually roam, I'd be worried about the lack of breathability of waxed canvas (I'd be as wet with sweat as I would from the rain), but up in Scotland I'm sure you have different climate considerations! You'd be surprised how dry a wool cloak and hood can keep you, though. I always find photos taken at a bit of an angle interesting, but if it really bothers you, I've used a Gorillapod to attach my phone to trees and the like for pictures, and it's worked quite well. Oh, that looks like a fantastic time! And I'm still agog that you've gotten SO MUCH done in such a short period of time! Like Taurinor I think you may find trying the same experiment in wool interesting: I find wool better right up until the point it gets actually soaked through, at which point it's sooooo heaaaavy. Takes a lot to get there though. Beautiful countryside, and a great kit. I thought that hood might be waxed canvas, the way it stands up instead of hanging off of your face like mine does. Taurinor wrote: I'd love to get some details on your shelter components - what are you using for your tarp and groundcloth? The ground sheet is cut from an old oil cloth tarp which was meant for keeping a log store dry. I didn't bother to hem the two sides I cut but it doesn't look like it will fray quickly. I cheated when I made the shelter tarp, that was a rip-stop nylon tent fly-sheet (you can just about see on the photo that the inside has that silvered coating to reflect heat). All I did was reinforce points around the edges with canvas and put in eyelets. To give you an idea of scail the ground sheet is 6ft x 2ft 6". Taurinor wrote: Where I usually roam, I'd be worried about the lack of breathability of waxed canvas (I'd be as wet with sweat as I would from the rain), but up in Scotland I'm sure you have different climate considerations! You'd be surprised how dry a wool cloak and hood can keep you, though. It was so cold and windy most of the time that I was glad of the extra layer. 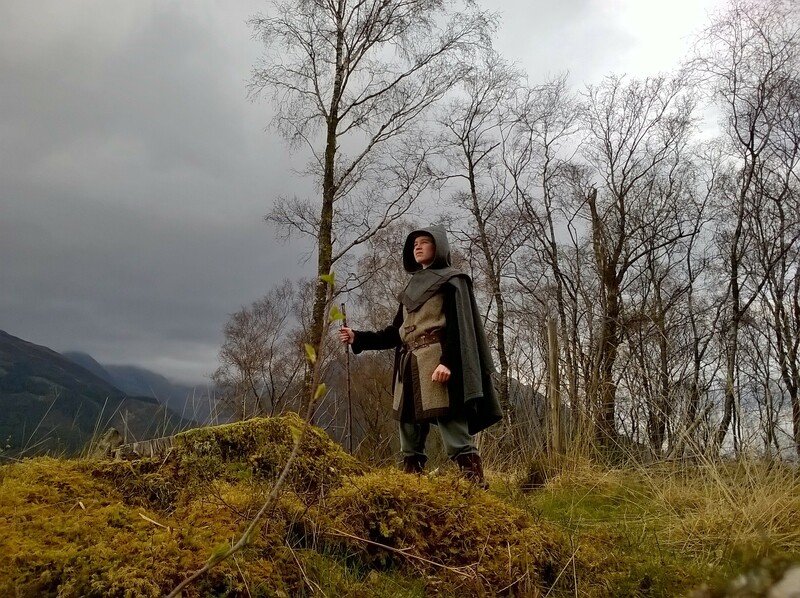 I didn't have an issue with breathability, partly because it was cold, and partly because the cloak is short and loose, so there is a lot of air flow underneath it. In the 7th photo I'm nearly 200m above the valley floor (where I was staying) and I climbed that quite quickly and only noticed sweat on top of my shoulders where my cloak sits and behind my pack. My only real worry when I started the project was how heavy it would be when it was done. My panic was added to when i receved the fabric and the package was really heavy. Turns out when I opened it that the supplyer had a roll end and had sent me 2 yards extra, phewww panic over its still a lot lighter than a wet wool cloak. Elleth wrote: Like Taurinor I think you may find trying the same experiment in wool interesting: I find wool better right up until the point it gets actually soaked through, at which point it's sooooo heaaaavy. Takes a lot to get there though. The answer to how dry wool can keep me is not dry enough, I tryed wearing my wool cloak (made from an army blanket) in the rain here in the UK, that was heavy set in rain and it soaked through in just over two hours and was really heavy wet as Elleth says. Although if it's only light drizzle it never seems to soak through. My cloak is wool blend (only 60℅ wool), maybe if it was all wool it would be better? I don't know how the blend is affecting things (it depends on what the wool is blended with), but my guess is that if it's an army blanket of relatively low wool content, most of that wool is going to be recycled wool. That means it's been processed multiple times, and most likely has had all the lanolin stripped from it. Since lanolin is a wax, it helps smooth the fibers and increases the water resistance. The tightness of the weave makes a difference, as well. I suspect in a heavy rain, a ranger would be more likely to hole up some place than press on and get soaked, unless his/her mission required it. If said ranger did have to press on, his/her soaked 100% wool cloak would retain 80% as much heat as it would bone dry, so while it would be uncomfortable and heavy, it would keep the ranger alive. Our modern work schedules, financial situations, and the like don't always allow us to make the same decisions as a Ranger in Middle-earth would in a given situation, unfortunately! Taurinor wrote: I suspect in a heavy rain, a ranger would be more likely to hole up some place than press on and get soaked, unless his/her mission required it. You forget something, it almost always rains in the UK, and even more in Scotland. If I stopped for rain I would never get anything done if I look out the window now, it's raining! Hence complaining about the weather is a favorite British pass time. I don't imagine the sort of dismal, misty rain that is very particular to parts of England would stop a ranger if he or she was in a wooded area and had a cloak and hood - I've managed similar weather in the woods I wander (walking the dog) with a wool jacket. I have also personally experienced sunny days in Chester, York, and London, so I know for a fact that it isn't always raining in all of England! Those are drier regions, though, and I understand that Scotland is an entirely different animal. Fantastic photos. There's no shame in balancing a camera on a tree or log...I do it all the time! I'm thrilled to see how invested you are in this...can't wait to see where you take use next! What a great adventure, thanks for sharing. In the darkest part of Sherwoods glade, in the thickest part of the wood, there are those who say, can still be seen, the ghost of Robin Hood. Wow that's really cool! Scotland, nice! Nanye Anduril i ne Narsil i macil Elendilo. Fantastic! I don't know how I missed this post the first time around, but lookin' good! If not for the title I'd have thought you were in Snowdonia. Very nice and YESSS we want more detailed pictures ! Curious about aspects of the hood so pics will help.